The Precor S3.45 Strength System helps you improve your strength conditioning more efficiently. Biomechanically designed to support good form and a full range of motion, the Precor S3.45 Strength System S3.45 provides dual resistance – resistance when your arms move outward and when your arms move inward – providing faster results. The Precor S3.45 Strength System helps you improve your strength conditioning more efficiently. 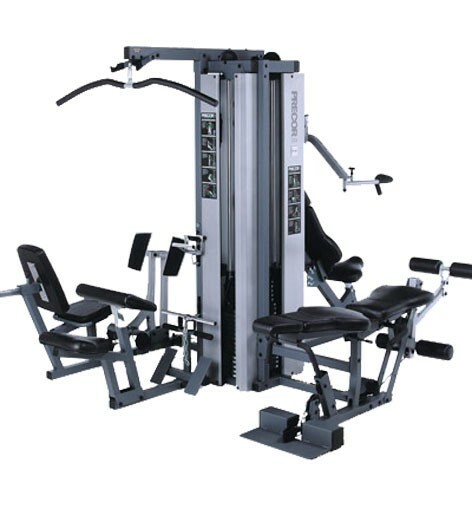 Perform more than 30 types of lifts, rows, raises, curls, crunches, pull-downs, and presses at up to four compact stations – pulling/preacher, pressing, leg extension and the optional leg press. Three individual weight stacks make it easy for multiple people to use it at the same time. The Precor S3.45 Strength System is designed to support good form and provide a full range of motion with smooth, silent weight movement using free-floating guide rods and sound-absorbing rubber ends which eliminate metal-to-metal contact. Increase your range of motion with the S3.45 unique design that provides dual resistance when arms move away from the body and inward while arms are outstretched. Call 1-800-875-9145 to speak with one of our fitness advisors with any questions you may have. Go To FitnessZone to order your Precor S3.45 Strength System. Ergonomic lat bar, 18"" chromed straight bar with rotating handle, ankle strap, ab/tri strap and detailed instructional charts. Biomechanically correct design supports good form and a full range of motion – two key elements in reaching your strength-training goals. Provides dual resistance for greater range of motion when arms move away from the body and inward while the arms are outstretched. Increase the number of reps and overall effectiveness of your workouts with our unique press design that lets you drive the arched path of motion. Increase upper-body strength in arms and shoulders with decline, incline, standard and shoulder press exercises using easy-to-adjust handle bar and set positions. Perform seated and prone leg extensions and curls to work quads, hamstrings, glutes and more. Ankle pads are self-adjusting. Perform leg presses to work your legs and calves. Preacher curl / Roman chair station for back and core exercises. Electrostatic powder coated steel for durability and appearance. Ratchet and lock system properly positions seat backs and pads for a comfortable custom fit. Vinyl over contoured foam for comfort. 1-inch (25.4 mm) diameter chromed steel free-floating guide rods with sound-absorbing rubber ends to eliminate metal-on-metal contact for quiet operation. Nylon / fiberglass pulleys. 1/8-inch (3 mm) military spec cable with nylon sheath for minimal wear and more flexibility. Swiveling cable ends are tested to 2,000 lbs (909 kg) tensile strength. High-quality ABEC-rated ball bearings (Annular Bearing Engineers Committee). Custom-designed, custom-molded cast iron top plate. 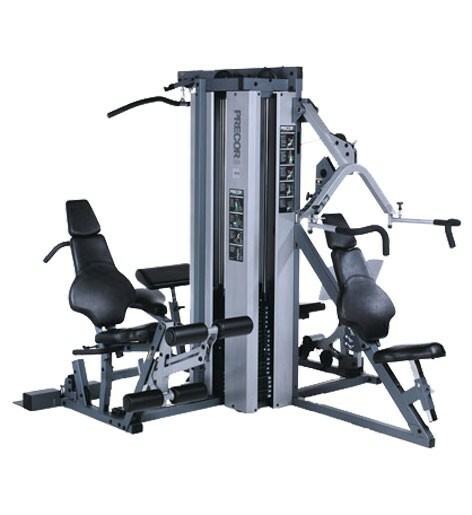 Order your Precor S3.45 Strength System from FitnessZone.com today!